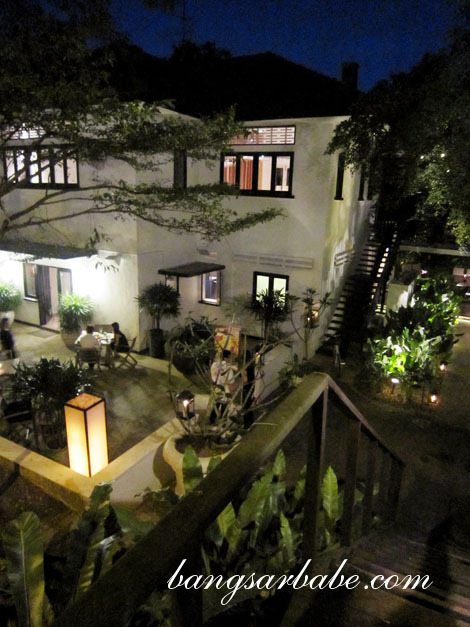 Despite our initial disappointment with Gastronomia Da Paolo, rif insisted we should try Da Paolo Bistro Bar in Rochester Park just 5 minutes from our hotel and Buona Vista station. 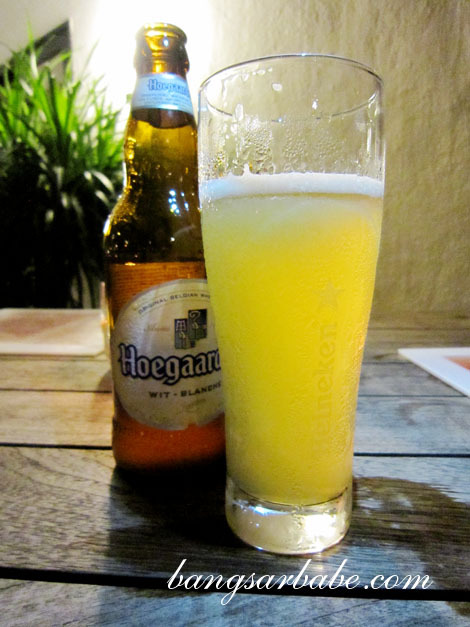 Housed in an old, colonial bungalow, the restaurant felt cosy and laid-back – perfect for a quiet night out. 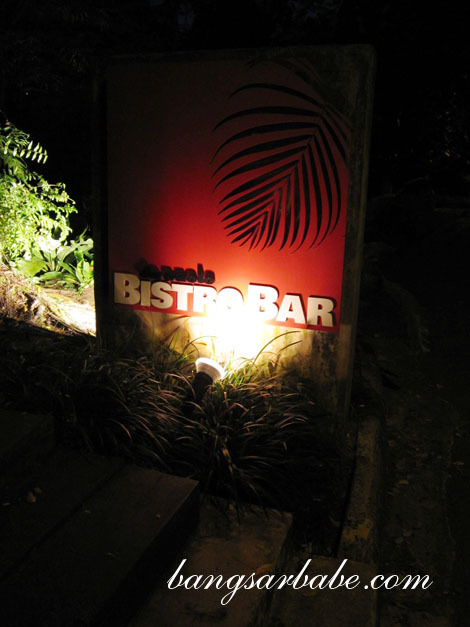 It was a full house that night and since we didn’t make any reservation, we settled for the al fresco seats instead. 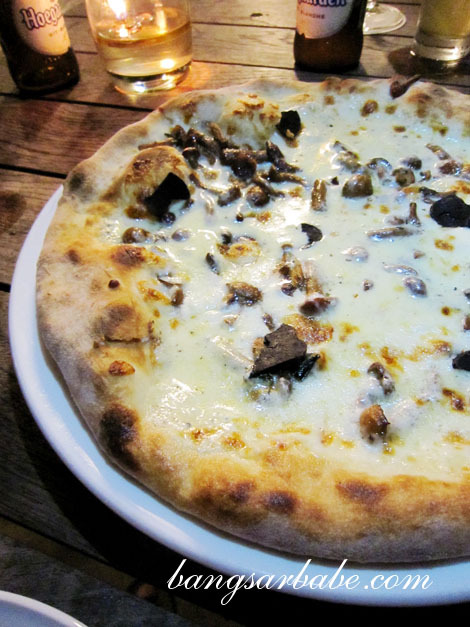 The mascarpone cheese, mushroom and black truffles pizza (SGD27) boasted a crackly, thin crust. I found the combination of mascarpone, earthy mushrooms and black truffle shavings a full-flavoured and satisfying starter. 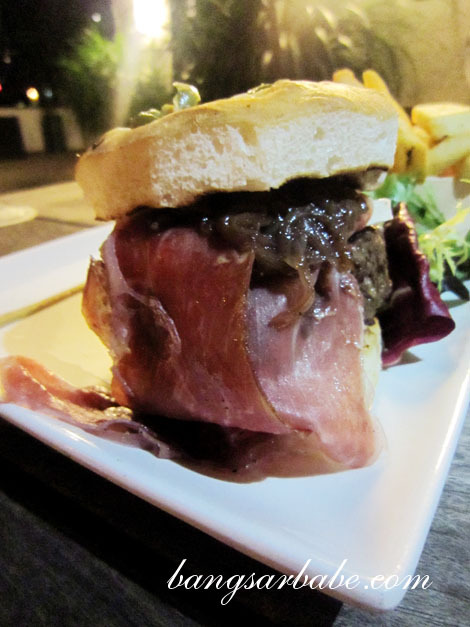 The grilled wagyu beef burger (SGD27), an assemblage of Italian parma ham, porcini mayo, caramelized onions, brie fondue, crispy wedges and focaccia burger bun, sounded promising. This was quite good. The meat was tasty a mix of fatty and lean, and medium rare throughout. 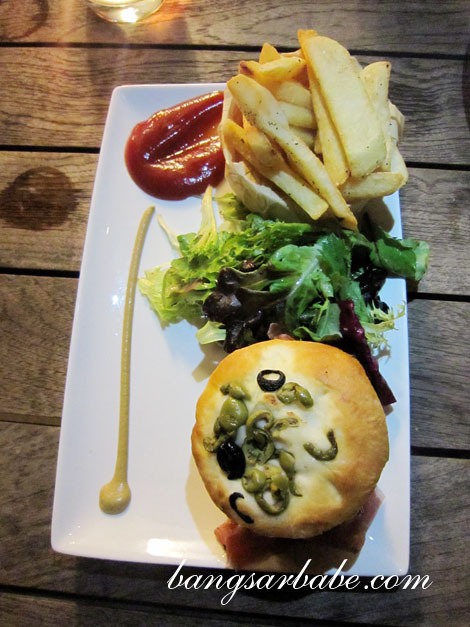 The complementing flavours of parma ham and brie accentuated the patty, and the focaccia – toasted on both sides – had a good bite. 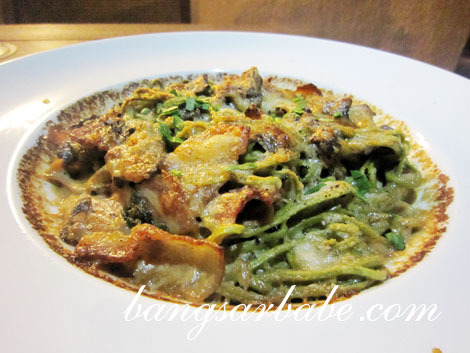 That said, it was rif’s spinach tagliolini gratin (SGD22) that wowed. 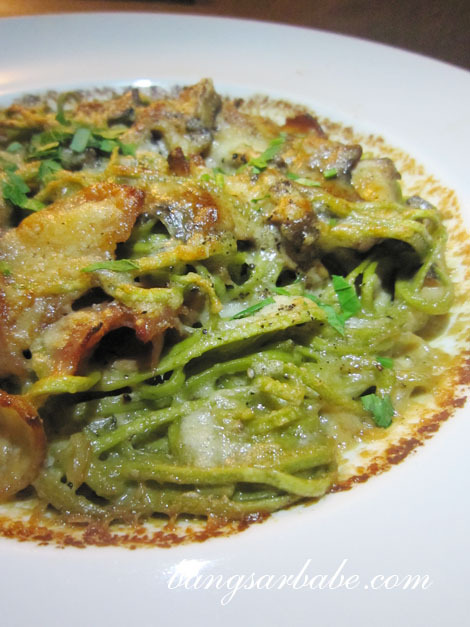 The pasta, baked with parmesan, cream, pancetta and cepes mushroom remained toothsome and had a rich, lingering flavour. 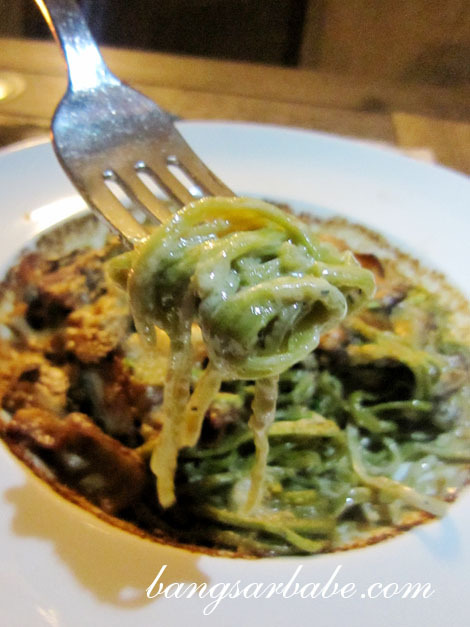 I liked how the cepes mushroom added an earthy and faintly nutty dimension to this dish. Simple, yet delicious! I found myself sneaking bites from his plate. We waited more than 45 minutes for the dark chocolate soufflé (SGD22) when the waiting time was 20 minutes. While service was slow, our waiter was courteous. He gave us a complimentary peanut butter dessert because we had to wait long for our soufflé. This was pretty damn good. Peanut butter, chocolate cookie and nougat in layers, I almost wished my soufflé took another 45 minutes so I can get another complimentary portion of this. Lol! 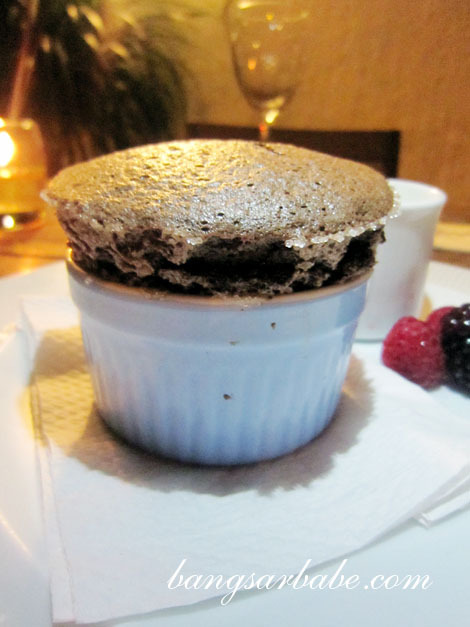 But that didn’t happen and eventually, we got our dark chocolate soufflé; billowy like the inflated ego of some guys I know. The firm outer shell gave way to an impossibly light centre – so fragile, yet so rich in cocoa flavour. It’s best to eat this quickly, for if left for too long, it will deflate and you’ll be left with a chocolate omelette. Apart from the service, we were pleased with my dinner at Da Paolo Bistro Bar. This was the best meal we’ve eaten in a while, hence the rating below. Verdict: The tagliolini and dark chocolate soufflé are a must-try. i will go back to singapore just to eat this! best food blog in town….but you already know that!! always makes me hungry even for food i don’t normally fancy.